Wind is a big deal for residents of North Texas and Oklahoma. People in our region love telling stories of historic tornadoes or big storms with serious, straight winds. It’s almost a point of pride that we live in such adverse conditions without flinching. Unfortunately, for local commercial building owners, wind is a very real and serious threat to their property, business operations, and livelihoods. Every roofing system is susceptible to wind uplift, which occurs when wind forces its way between the outer membrane and the roof deck. 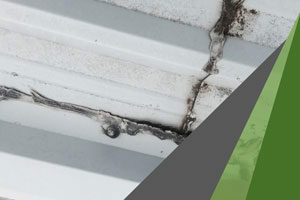 When this occurs, wind forcibly tugs at and peels away sections of your conventional flat roof, or it forms splits in your roof’s membrane, compromising the soundness of the entire roofing system and resulting in leaks and water damage to your building. 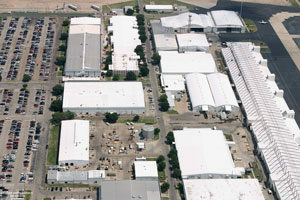 However, some commercial roofing systems resist wind uplift far better than others. When it comes to fighting high winds and damage from uplift, spray polyurethane foam (SPF) is the best roofing material available for most commercial and industrial settings. Because an SPF roofing system is sprayed on as a liquid, the foam adheres to the deck itself and then expands, forming a custom fit for almost any roof. That form-fitting surface membrane provides some key benefits when resisting damage from high winds. roofing panels or pieces attached with interspersed fasteners that can be pulled away, compromising the entire roof and leaking water into the ceiling and interior of your commercial building. Conventional roofing systems that are pieced together and attached to the deck leave dozens, if not hundreds, of seams and weak points of attachment where strong winds can push between the deck and outer membrane, peeling away your roof. Even if you don’t experience a catastrophic roof failure that comes out of nowhere, strong winds stress these weak points over time, increasing the likelihood of leaks and opening up possibilities for both major roof damage and interior damage down the road. On the other hand, an SPF roofing system uses the entire roof deck as its point of attachment, which leaves no weak points for wind to squeeze between the membrane and deck. Instead, you get a form-fitted, rigid, extremely resistant barrier of protection against wind damage and all other sorts of severe weather. The liquid spray application and expanding foam composition together result in an outer membrane that fits and seals around any fixtures, protrusions, HVAC ducts, or surface features. While these features create serious weaknesses in resisting wind uplift for conventional, non-form-fitting commercial roofing systems, each protruding pipe, vent, or wall actually provides additional rigidity to the entire SPF system. In other words, SPF’s continuous, seamless membrane, which is created by the unique liquid, sprayed-on application, takes away most of the opportunities for wind uplift to occur. Depending on the roof underneath, an SPF roofing system applied by DFW Urethane can offer an I-90 wind uplift rating, which is second to none. Unfortunately, wind uplift isn’t the only threat storms and high winds pose to commercial roofing systems. During tornadoes or other storms packing high winds, flying debris, hail, and fallen tree branches create additional possibilities for costly damage to your commercial roof, separate from the problem of wind uplift. 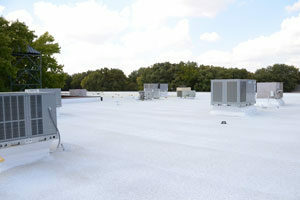 Spray polyurethane foam roofing systems are far more able than other conventional flat roofs to withstand impact damage from hail or flying debris. Their tough, thick, seamless construction is extremely durable and slightly elastic, which absorbs the force of impact without cracking or splitting. DFW Urethane’s proven FM/SH-rated roofs combine rigid spray foam that has a high compressive strength with an average 45-mil-thick Neogard Permathane II elastomeric polyurethane coating, which, for reference, can resist hailstones 1¾” in diameter. One of the major benefits of an SPF roofing system is that it can be applied on top of your existing roof. Not only does that mean your building can stay open and operational while your new roofing system is installed, but it also means you avoid having to pay for a roof removal. Roof removal and replacement (buying a new roof) comes with more pain than simply having to shut down your business and pay for the removal itself — it also means adhering to a different set of local building codes, codes that often don’t apply to a reroofing project (almost all new SPF roofing systems are reroofing projects). If you have to remove your existing roofing system and purchase a new roof, that roof is usually required, in many cities and municipalities in the state of Texas, to have an insulation of R-25 or more. With a reroofing project, most cities aren’t worried about any added R-value, although the average addition of 1.5” to 2” of SPF roofing generally adds an R-value of R-10.5 to R-13.5. Of course, whether or not your project will be a reroofing project or will require a new roof depends on how many roofs your building has or has had, existing damage, your unique needs for the building, and a variety of other factors. The structure of the existing roof also makes a difference. Wood and metal roofing systems are often much easier to apply an SPF roofing system on top of, whereas a concrete roofing system creates added difficulty. Wood and metal roof decks make life easier when it comes to installing a new roofing system, and this is true for all roofing systems, not just SPF. A concrete deck is more problematic. Concrete decks require concrete screws that are expensive. Installing these screws is a slow process because it requires drilling into hard concrete. What If I Have a Concrete Roof? Method 1 has the highest wind uplift rating in the roofing industry. When testing wind uplift with this method, the testing equipment can be totally maxed out, and there still will be no sign of uplift. Option 1 is the highest performing system by far as it leaves behind no seams and uses no screws. Remember, water cannot travel thru closed cell polyurethane foam. Option 1 is 35% more than 2 and doesn’t perform quite as well. Still, both system are higher performing than the best TPO on the market. The question you have to ask yourself is this: How important are the contents of your building? 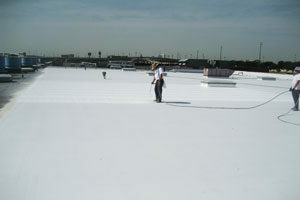 If you positively can’t have any water in your building, then you should consider an SPF roofing system. 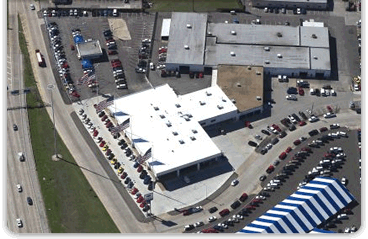 Considering the risks of wind and storm damage to commercial roofs that North Texas business owners face, getting the protection and peace of mind that an SPF commercial roofing system provides can certainly be a great investment. Even more assurance and peace of mind comes with your new SPF upgrade when you consider that DFW Urethane’s SPF roofing system carries a 10- or 15-year manufacturers’ warranty depending on the specific project. Given the nature of where we live and do business, we feel SPF is the best fit for almost all commercial building situations. In addition to concerns about wind and storm damage, DFW Urethane is here to help you with any and all of your commercial roofing and insulation needs in Dallas-Fort Worth. Contact us here to get a recommendation and a quote on an SPF roofing system and/or an elastomeric roof coating.